I’ve been looking for my Nicaragua surfmoto bike for awhile and finally pulled the trigger today, buying this new Yumbo 200 this afternoon. A bit of background…I’ve been spending time in Central America for 20 years now, and have a condo on the beach in front of Panga Drops in Nicaragua. I visit Nicaragua a few times each year, and every time I end up renting expensive vehicles that can deal with the roads and accommodate my surfboards. Most of my driving is off-road, and whether off or on-road, the whole time I’m wishing I had a motorcycle. I’ve wanted to ride my DR650e down and leave it here, but it’s a three week trip, at least, that would be followed by import tariffs that could cover the cost of buying a bike here in Nicaragua. I’ll make the ride eventually, but in the meantime, buying a bike here in Nicaragua seems the best plan. Once that decision is made, the next fork in the road is whether to buy Japanese or Chinese (or Indian). Japanese bikes cost twice as much as Chinese, and more. They’re better, of course, both in reliability and handling, but that’s more hearsay than fact as reviews are scarce so you’re left to asking around. Also, there are no dual sport bikes over 200cc, Japanese or otherwise. Most of the Japanese bikes are 125 or 150cc – about a fifth or less of what I’m used to riding. I test rode a used Honda Bross 15o. It rode OK, but it had over 80,000 km on the odometer, so while it had been well-maintained, it just wasn’t a great idea. Besides, the guy wouldn’t go less than $1,600, and I could get a Yumbo 200 for $1,200. Which I did, but not until I scoured Rivas for something that seemed more, well, better made. And what might be better handling. With these rock-strewn dirt roads, handling was most important. But you can’t test ride the new bikes, so handling would be a guess. I looked at Dayun, Raybun and others, but mostly Serpento. Genesis was closed. They all seemed cheaply made, and I almost bought a Serpento, but the only 200 they had was a sort of supermoto, and I wanted an off-road/dual-purpose bike. I bought the Yumbo 200 in Tola for $1,200. When I rode away two things were noticeable. First, the brakes totally sucked. Second, the forks were crooked. I returned to the shop and we straightened the forks. Maybe the brakes need breaking in. On the ride back to Hacienda Iguana the speedometer cable detached itself, but that was the only mishap over the 14km ride. More to come on this. Sorry for the bad photo above. Last November (2016) I sold the Yumbo back to the dealer I bought it from. It really was a spindly piece of junk, so I learned my lesson. 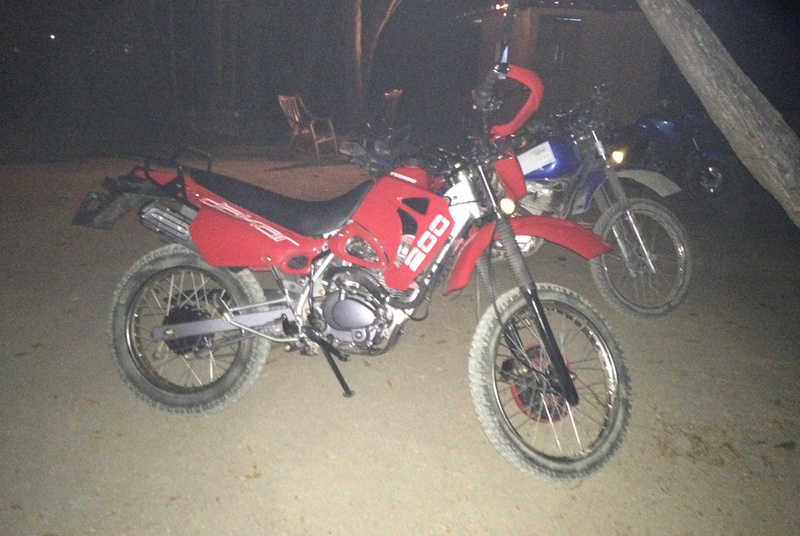 I bought a low-kilometer, 2015 Yamaha 125XT from a friend in Hacienda Iguana and couldn’t be happier. It’s 75cc down on the Yumbo, but nothing breaks, it handles twice as well and will hold its value better, too. I sold the Yumbo for $400, a third of what I bought it for 2 years earlier, but that’s OK.